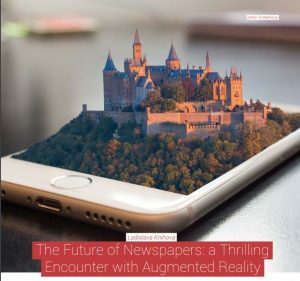 The objective of this study is to examine and better understand the impact of new technologies on multimedia journalism, mainly from the viewpoint of augmented reality (AR). Then, in the context of literature review, and in view of recent real-world examples of AR experience introduced by Harvard Business Review, the author will explore and critically evaluate the idea of using AR as a tool to help attract customers to newspapers and other print media. Apart from compelling content, newspapers can start offering a thrilling and enjoyable experience thanks to the implementation of innovative technologies. Thus, they can enhance multimedia journalism and take it to a whole new level. The study is complemented by an empirical probe focused on the current preferred ways of reading newspapers by readers in both the Czech Republic and the Slovak Republic. The survey also reveals the level of the survey respondents’ awareness and imagination of ‘live images’ as an engaging part of media content. Simultaneously, specific examples of AR used in different industries are delineated and associated questions and directions for further research are suggested. Celý článek si můžete přečíst v odborném časopise MLAR – Media Literacy and Academic Research zde.